Peak District Luxury Group or Corporate Accomodation, 5 Star Self Catering Holiday Farmhouse and Annexe ~ Sleeps 20 guests in 9 bedrooms and 8 en-suites. Set in the heart of the Peak District National Park. Ideal venue to host celebrations, special occasions and family get-togethers for larger Groups. Peak District Cottages at Uppermoor Farm occupy an enviable, elevated location. Built in traditional limestone typical of the Peak District National Park, it dates back to the late 18th century. Recently renovated and refurbished bringing it up to a luxury 5 star ‘gold’ standard. It now sits in an attractive courtyard setting occupying two sides of the courtyard. It can sleep a large group of up to 20 guests. The Farmhouse & Annexe property offers a choice of nine spacious bedrooms and 8 luxury en-suites or private bathrooms. Each bedroom is individually furnished with charming personal touches and attention to detail. 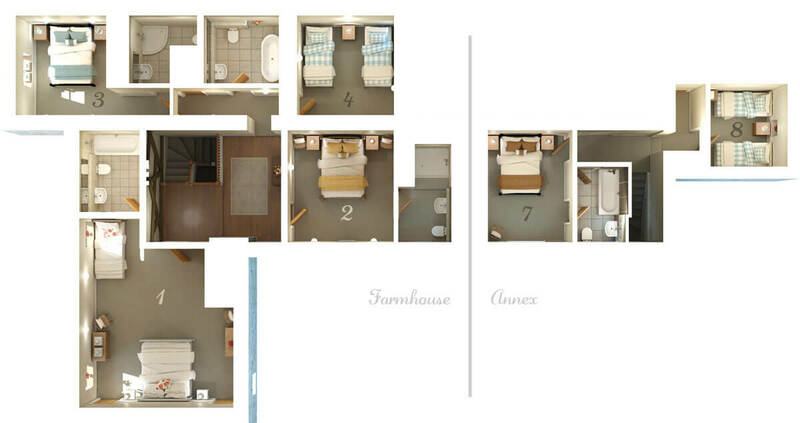 The ground floor has the advantage of being an open-plan design giving a large and spacious feel to the farmhouse. It has the benefit of oil fired central heating throughout. The majority of the rooms have double aspect windows, most with fabulous views of the Peak District National Park, giving the whole property a light and airy opulence. The old character Front Door opens up to a large light reception/dining hall area with oak flooring and an open galleried staircase. The open plan Dining area is furnished with an antique pine table with seating for 10 chairs. There is a further oak refectory table which sits in the elegant dining hall and usually has a ‘welcome vase of flowers’ on it; this can simply be pulled into the centre space, and again can comfortably seat a further 10 people; to give a seating plan of 20 adults in the same room. Dividing the Dining area from the Sitting Room is a feature ornate wooden balustrade with feature steps down to the large Sitting room and to the right opens out to the breakfast end of the kitchen area. The kitchen is large, modern and fully equipped area with white Shaker style fitted cupboards and solid wooden worktops. It has a large Belfast sink with luxury black granite surrounds and the cosy benefit of an AGA type oil fired cooker adding both warmth and atmosphere to the farmhouse kitchen making it the heart of the home. One end opens out to a breakfast area furnished with comfy high-back pine stools and a soft squashy leather sofa for enjoying that morning cuppa. There are French windows, which open out to a paved and gravelled terraced area; to enjoy alfresco dining, whilst soaking up the stunning westerly views over the fabulous countryside of the Peak District National Park. The sitting room is a lovely spacious room, which has retained much of its original character with exposed beams. There are no less than five windows in here, three with panoramic westerly views of the Peak District National Park countryside. The remaining two overlooking the courtyard, one adapted into a comfy window seat with scatter cushions. Ample deep-seated sofas and comfy chairs occupy this room with antique pine coffee tables to sit that gin and tonic whilst you gaze at the flames dancing in the roaring log fire. There is a large feature double sided wood-burning stove shared with the adjoining Orangery. The Orangery has an abundance of character and retains its original limestone feature wall incorporating the double-sided wood-burner stove. The west wall has a large glazed area with French doors opening directly onto a sheltered flagstone paved terrace area. Here you can chill-out on comfortable garden furniture and enjoy the breath taking far-reaching views of the surrounding Peak Park countryside. This room is warm and cosy in the winter with the wood-burning stove, and is an idyllic sun trap during the warmer months. It’s a great place to relax and enjoy the Peak District Park stunning sunsets. On the first floor there are four large bedrooms, approached via a galleried landing, having a south facing window looking out towards Ashbourne and beyond. There’s an additional, sumptuous main bathroom. This bathroom has a luxury free standing roll top bath from which you can soak up the views towards Bakewell. Eight of the nine bedrooms have their own individual and luxury en-suite facilities, which have luxurious large fluffy towels and bathrobes. The master bedroom is a huge stunning double aspect room, with exposed timber trusses. It has views to the east overlooking the spacious courtyard and to the west giving a panoramic landscape of the Peak District National Park in the direction of Hartington and Biggin. It has been furnished as a family room with a king size oak sleigh bed and a 3′ pine single bed. 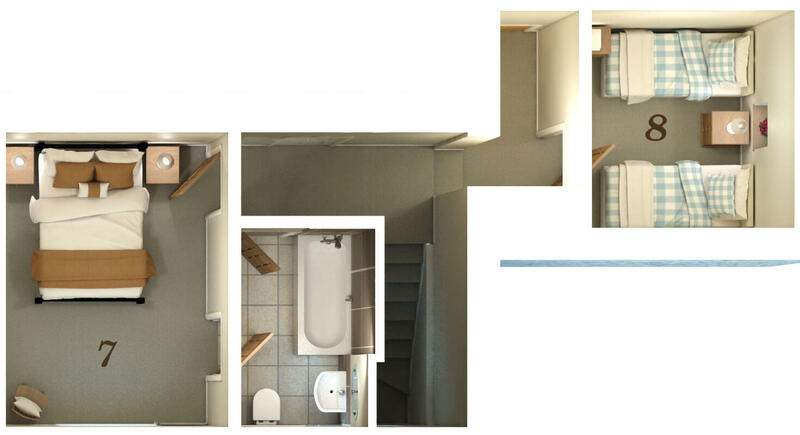 There is a spacious, luxury, en-suite comprising of a large bath with shower above. The guest bedroom is an elegant, large, south facing room over looking the spacious courtyard with far reaching views beyond of the Peak District National Park and towards Ashbourne. It has a fabulous carved antique king size four poster bed. This room benefits from a spacious, luxury wet room style en-suite, again with enviable open views of the Derbyshire countryside. Bedroom 3 is a spacious double room, furnished with a king size cast Iron bed and having stunning westerly views across the panoramic Peak District National Park countryside. It’s own luxury en-suite bathroom has a large deluxe cubicle shower. Bedroom 4 is a cosy twin bedded room, furnished with solid pine 3′ single beds. This room has the private use of the large family bathroom complete with roll-top bath. The ground floor in the main Farmhouse has a further 2 spacious bedrooms. Bedroom 5 is a spacious four poster room with a large king size four poster antique bed. It has easterly views overlooking the spacious courtyard and beyond. This romantic room has a luxurious en-suite to include a large wet room style shower facility. Bedroom 6 is a very generous size room overlooking the westerly aspect of the farmhouse and garden. This room has been furnished as a family room, with an enormous 6′ super king size divan style bed and one 3′ single divan. It also has a luxury en-suite with a large wet room shower. Ground Floor: Entrance Lobby and Downstairs Cloakroom: Leading through a Georgian style stable door onto a fully tiled floor. Facility for hanging outdoor coats and walking boots. Ground floor cloakroom to include a shower. The kitchen and breakfast room is a large, very light area having the benefit of two windows overlooking the rear aspect of the property. It has a fully equipped modern kitchen combining traditional country comforts with modern 21st century luxuries. It benefits from numerous electric appliances to include, a dishwasher, washing/drying machine, integral fridge and separate freezer. The white Shaker style kitchen units have black worktops creating ample storage space for the most creative cooking. The breakfast end is furnished with a circular antique pine farmhouse table and comfortable farmhouse kitchen chairs. Has retained much of its original character and has a feature inglenook type fireplace with a wood-burner stove. It has been tastefully furnished with a deep-seated sofa and chairs, with scatter cushions. An open-plan oak staircase leads off to the first floor. Is a light and spacious ground floor room with exposed beams giving the option of a 6’ super king size double bed or two 3’ single divan beds. This bedroom has the benefit of the adjoining ground floor Cloak Room/ shower room. Is a pretty room with an old Victorian fire grate. It has a double cast iron bed and direct en-suite access to the main family luxury bathroom. There are two south facing windows overlooking the courtyard with enviable far-reaching views of the surrounding Peak District National Park. Is a luxury fully tiled bathroom, with a separate door accessed from the landing, providing a large bath with shower above. Is a light and airy twin bedded room furnished with two pine 3’ single beds and has adjacent access to the family bathroom. Outside: Large garden areas with herbaceous flower beds and lawn area to include a landscaped bank area planted with a variety of pretty evergreens and seasonal flowering shrubs. A choice of private flagstone terraces, complete with ample comfortable garden furniture and chairs for everyone. The spacious enclosed courtyard setting at the front has an ornate central granite water feature surrounded by clusters of red and yellow fragrant roses. Ample secure and private parking areas which have well lit dawn to dusk night lighting; to enable you to take full advantage and enjoy that late night stroll in ‘your own Peak District Private Park’. Our Farmhouse and two Holiday Cottages are set in peaceful countryside in the midst of the Peak District National Park. We offer three individual self catering holiday cottages which can be occupied separately or taken together on an exclusive group booking. The main Farmhouse (Sleeps 14), adjoining Horseshoe Cottage (Sleeps6) and adjacent Coach House (Sleeps 4) all date back to the 18th century and whilst we aim to meet the needs of all our guests there are some period features which might make access difficult for people with limited mobility. We are located on a hill and have some rooms at different levels. There are two steps from the car park area into the courtyard setting and between some rooms. It is with regret that none of our cottages are ideally suitable for wheelchair users; due to some doorways being narrow and so would not be appropriate. We are located at the end of a rural green lane which leads only to Uppermoor Farm. The farm is approached over a cattle grid. Our location is peaceful and fairly remote and not ideally suited to those travelling without a car. The nearest shop is approximately 1.5 miles away in the nearby village of Parwich (Tel: 01335 390212). There is very limited daily bus services, mainly into Ashbourne only, and the bus stop is outside the village Pub (The Sycamore Inn) which serves as the village shop too. The nearest railway station is Derby or Chesterfield both approximately 20 miles away. Taxis are usually available at the station but we can book one for you in advance if required. There nearest taxi service is Ashbourne Taxis (Tel: 01335 345198) which is 8 miles away..
. We regret we do not have facilities to prepare documents in Braille. Our website www.uppermoorfarmcottages.co.uk provides pictures of our accommodation and further information about the services we provide. You can contact us by e-mail or telephone. Please see the “Contact Information” section of this document for full details. Please advise us of your anticipated arrival time so that our House-Keepers can welcome you and show you in. There is ample parking on the tarmac drive in front of the main courtyard, with dawn to dusk security lighting. The paths are 120cm wide and 20 metres long to the Farmhouse front door with an additional step of 14cm high half way along. The path is 10 metres long to the Coach House main entrance with a further two steps each being 20cm high. There is ample parking on the tarmac or concrete surfaces. A sloping gravel pathway leads onto a gravel rear terrace and the main entrance to Horseshoe and the Farmhouse rear entrance doors. There are no steps to the front door. There is an alternative entrance via the back door which only involves one step of 14cm up into the utility/boot room. The Farmhouse – Ground Floor – all open plan: (seated dining for 20 guests). The front door opens into the large open plan Dining Hall with an oak flooring. The elegant dining table can be moved to allow additional seating for group dining of up to 20 guests. There are two steps each being 15cm down from the Dining Hall into the open plan Sitting room and then further on into the Orangery. The Sitting room is fully carpeted. Large flat screen TV and DVD player with remote control. The Orangery Room is Quarry Tiles throughout. There are French Windows 168cm wide opening onto a paved rear terrace and the garden from the orangery room. There are two steps of 17cm followed by three further steps of 17cm each leading down to the two ground floor bedrooms. There is a downstairs cloakroom with a doorway width of 64cm wide. The kitchen breakfast area is open plan with French Doors onto a paved rear terrace and lawn. An oil Fired Aga Cooker in the kitchen, with oven doors opening towards you. Height of lowest shelf in top oven is 53cm and bottom simmering oven bottom shelf is very low only 24cm high. The Belfast sink and granite drainer is 94cm high with cupboards under. Worktop heights are 94cm in both Kitchen and Utility/Boot Room. Evenly lit kitchen with recessed ceiling lights and spotlights under wall cupboards. The Kitchen area and Utility/Boot Room has ceramic floor tiling. The Utility/boot room leads to the back door entrance. Further stainless steel sink is 94cm high with cupboards under. Large ‘American Style’ Fridge Freezer in Utility/Boot Room. There are 11 stairs to the first floor, each step is 19cm high. The stairs are carpeted. There is no hand rail. The farmhouse is centrally heated throughout with a double sided wood burner in the Sitting room and Orangery. Large basket full of logs supplied complimentary. Four double bedrooms are on the first floor and are carpeted throughout. 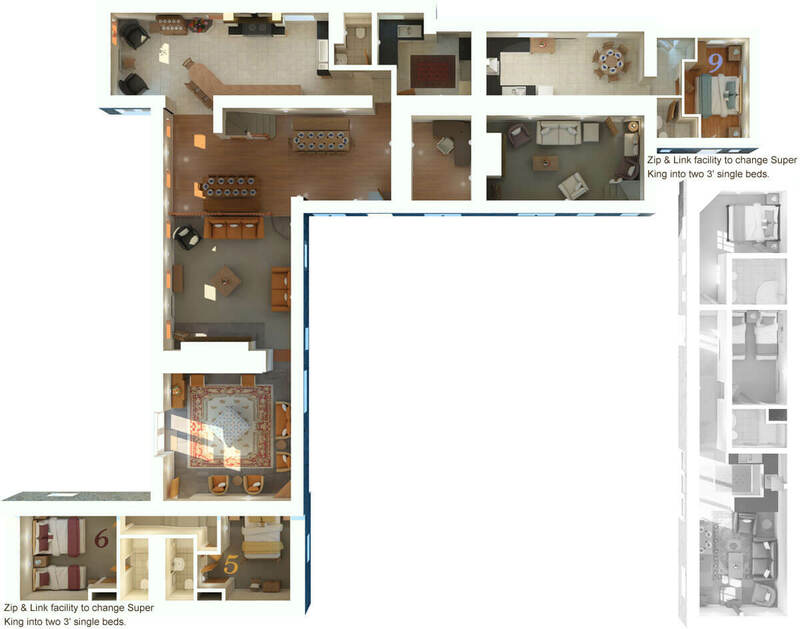 The master bedroom is a family/triple room. One small step of 9cm on the landing leading to the Guest Bedroom with a further step of 9cm leading to bedroom 3 and 4. Bedroom 4 has an additional step of 13cm.to its entrance. There are en suite facilities for all bedrooms..
Two bedrooms are on the lower ground floor each having their own en-suite facility. Bedroom 5 is a Four Poster Room and Bedroom 6 is a triple room. Bedroom temperatures can be individually adjusted on the oil fired radiators. We provide a hair dryer, torch, and radio alarm on each bedroom floor. Our beds are made with hypo-allergenic microfiber duvets and pillows. There is plenty of hanging space with each room having its own fitted wardrobe and 10 wooden coat hangers. Plus a chest of drawers and bedside cabinets. There are two chairs in all rooms except Bedroom 3 & 4 due to space limitations. Access to the garden is via the orangery or kitchen French doors. Alternatively the back door leads onto the rear terrace and landscaped bank. There are three steps leading onto the raised gravelled terrace.. There is a further terrace with ample garden furniture immediately outside the Orangery which can be accessed without climbing any steps. There is a lawn area and shrubs beyond the terrace. There is no separate laundry but each holiday cottage has its own standard size washing facilities downstairs. The Farmhouse has a separate washing machine and tumble dryer both front loading and in the Utility/Boot Room. Horseshoe Cottage and The Coach House Cottage has a washer/dryer combi, which is front loading, provided in the kitchen area. You are welcome to walk over the farm, please close any gate behind you. Some of the walking can be over steep terrain, but there is direct access from the farm to a footpath taking you into the village of Parwich, or alternatively to join Cobblersnook Lane which in turn joins up with the High Peak Trail. There is a fire blanket in the kitchen area of all our properties and smoke alarms on the landing and hallway of each. The building can be evacuated via any of the exit doors..
We do not permit any smoking in any of the holiday cottages, but feel free to smoke outside. Please refrain from throwing cigarette butts onto the garden or terraced areas. Mobile phone reception is usually good. Wi-Fi Access in all holiday accommodation. Telephone number: is 01335 390781 ~ Jan Hammond. Our Farmhouse and two Holiday Cottages are set in peaceful countryside in the midst of the Peak District National Park. We offer three individual self catering holiday cottages which can be occupied separately or taken together on an exclusive group booking. The main Farmhouse (Sleeps 14), adjoining Annexe (Sleeps6) and adjacent Coach House (Sleeps 4) all date back to the 18th century and whilst we aim to meet the needs of all our guests there are some period features which might make access difficult for people with limited mobility. We are located on a hill and have some rooms at different levels. There are two steps from the car park area into the courtyard setting and between some rooms. It is with regret that none of our cottages are ideally suitable for wheelchair users; due to some doorways being narrow and so would not be appropriate. Pre-Arrival We are located at the end of a rural green lane which leads only to Uppermoor Farm. The farm is approached over a cattle grid. Our location is peaceful and fairly remote and not ideally suited to those travelling without a car. 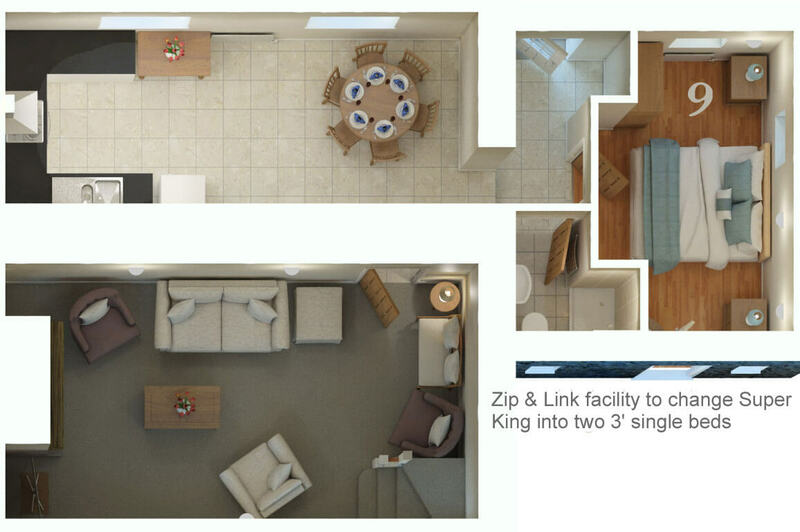 Ground Floor – Entrance Lobby, Cloakroom, Bedroom 3, Kitchen/Breakfast Room, Sitting Room. The front door is 80cm wide and opens into the entrance lobby/utility storage area, which has a ceramic tiled floor. The cloakroom door is 66cm wide and consists of shower cubicle, wash basin and toilet, with ceramic tiled floor.. Leading off the entrance lobby is Bedroom No. 3, the doorway is 74cm wide and no step. There is a wooden floor and two 3’ zip and link divan beds which can be either a King Size bed or 2 separate single beds. The Kitchen Entrance leads off the entrance lobby with one step 15cm high. The kitchen breakfast area is open plan with ceramic tiled floor. Stainless steel sink and worktops heights are 94cm in Kitchen with cupboards under. Electric cooker and hob, with lowest shelf height 46 cm. Door 73cm wide leads into The Sitting Room which is fully carpeted. 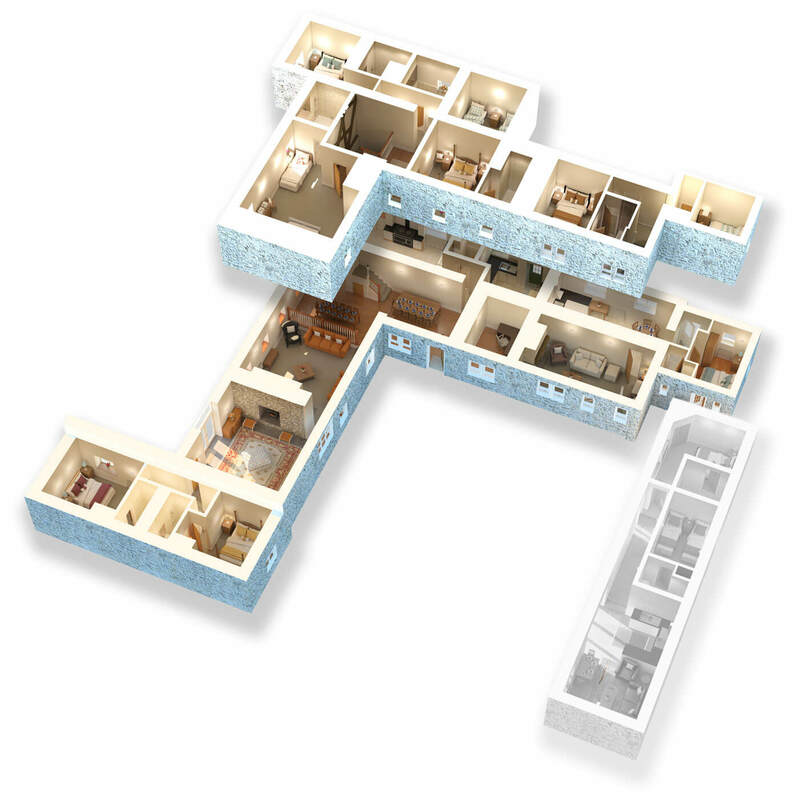 Open plan stairway with 11 stairs to the first floor, each step is 20cm high. The stairs are carpeted. There is no hand rail. Horseshoe Cottage is centrally heated throughout with LPG Gas radiators and a wood burner in the Sitting room.. The landing is fully carpeted and on the left is the family bathroom doorway is 66cm wide. Bathroom is fully tiled, complete with bath with a shower over. The master bedroom doorway is 66cm wide and contains a double wrought iron bed and is fully carpeted with two fitted wardrobes and bedside cabinets and a wooden chair..
To the Right of the landing going down two steps the first 14cm drop and the 2nd 20cm drop leads to Bedroom 2 which is a twin bedded room. There is a dressing table and one chair. Bedroom temperatures can be individually adjusted on the LPG fired radiators. We provide a hair dryer, torch, and radio alarm.. There is plenty of hanging space with each room having its own fitted wardrobe and 10 wooden coat hangers. Access to the garden is via the main kitchen door. A rear gravelled terrace is immediately outside the kitchen area with an oval wooden table and 6 garden chairs. There is a further raised gravelled terrace which is access via three steps and a narrow garden path. There is no separate laundry but each Horseshoe Cottage has its own standard size washing/drying facilities, which is front loading, provided in the kitchen area. Wi-Fi Access in all three holiday accommodation.